Earlier in the day, Rdio posted a touching farewell to its users. Using the data it had available to it, the company helped users recount the first song they ever listened to on Rdio, as well as a host of other fun facts. The company also provided a tool for everyone to download their data. With the help of an importer, that data can be used to create some sort of continuity between Rdio and a competing service like Spotify. 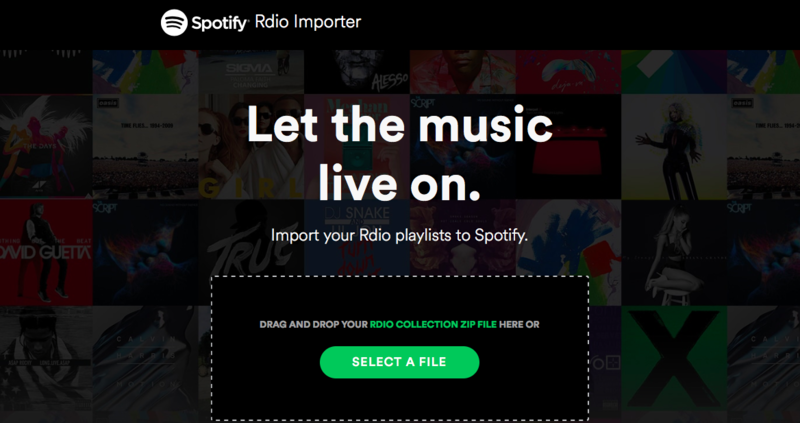 While there are several homebrew options to move one’s Rdio data to Spotify — at least one charges $5 for the service — Spotify has just begun to offer an official importer. Once you’ve downloaded your music information from Rdio, you can simply drag and drop the accompanying zip file onto the webpage Spotify has set up. From there, the webpage will take care of importing your favourite artists, playlists and saved music to Spotify. Rdio says it’s unsure how long it will be able to allow users to download their data.